Katie McGarry is a geniuos when it comes to story telling as we know with Pushing the Limits and Dare You Too. Both mind blowing gems that leave you raw and itching to reread them all over again. Crash Into You is no exception. Isaiah was always the unwanted fellow. He has gone through hard times with his mother in jail, jumping from foster home to foster home but he finally finds a place where he can see himself. With Noah and Beth. Only when he falls for Beth but then is just tossed aside when she finds her way with another man Isaiah is left to pick up the broken pieces of his heart. The only relief for him is his cars. Tuning, fixing and racing anything with an engine that purrs gives Isaiah the comfort to move on with his life. And that comes in the form of his angel, Rachel. Isaiah has been the bad boys in the previous books. That bad foster kid who is loyal to a fault and cares passionately about those that deem themselves his family. In Crash Into You we get to see this other side to him that cant help but make you love him even more. He's smart and sassy and total hotness on a stick! Covered with tattoos and buzz cut to go with, he burnt up the pages with his rawness. He shows real strength when other people would have lacked and that to me shows true character. When rich kid Rachel finds her way at a drag race and confronts Isaiah he whole world is turned upside down. He's drawn to her in a way he's never felt before. I absolutely adored Isaiah throughout every situation he had to go through. The flip side to Isaiah's story is Rachel. And I HAVE to be honest with you. I did not like her and I'm sorry. I thought she a little air head that didn't really fit with Isaiah. She wasn't total bad I will admit. I like that she knew about cars but it didn't really show through in her actions. He brothers all protect her like she's some broken doll which she hates but she doesn't really fight it. I get that her panic attacks were her flaw but I just didn't feel the strength from her as I did with Isaiah. I get that this is the kind of person that he needs but she just lacked to me. I found the she cowered more then really putting herself forward. I really wanted to like her but she just annoyed me. I imagined a strong willed yet timid girl for Isaiah. Someone who would fight him and be completely passionate over him. She put the breaks on every like make-out session they had which just left me feeling cheated. There were some good parts but I didn't feel the desire. That's just me and how I read it....does NOT mean that it still isn't good. "'Yes?" I say so softly he may not have heard me. His hand caresses the sensitive spot right below my chin, and with a gentle pressure, Isaiah raises my head until I look into those warm silver eyes. 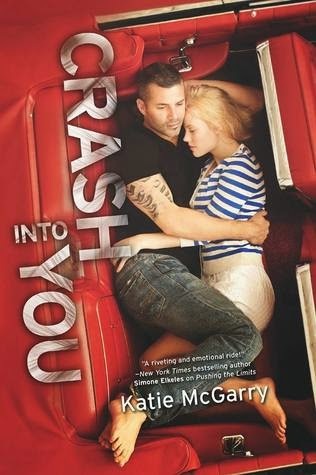 "I like you, too'"
Even though I didn't like Rachel I still loved everything else about Crash Into You. Katie just has a way of writing that is smooth but yet leaves you on the edge of your seat. Drag racing made your heart race and the threat of Eric really made you want to some how help them. We really get to see that Isaiah really does have some loyal friends, even in the new ones that they make. Noah and Beth both proved to be great secondary characters that showed the development of Isaiah from when we first saw him in Pushing The Limits up until now. Overall I still was completely hooked to this novel. I couldn't wait to get my hands on it and I finished it within a day of starting it. Its one of those books that begs you to keep reading and teases you with the thought that you'll be invincible if you stay up late reading it. Rush to the store to pick this one but make sure you read the first 2 books first. You will just enjoy all the characters so much better and appreciate Isaiah so much more! I'm so looking forward to this one. I really enjoyed the first two! !